Modern poetry on ruins performs an awakening call to the lurking real, to the violence of history in the making. The attacks in New York on September 11, 2001, and in Madrid on March 11, 2004, provoked diverse political reactions, but the imminence of the ruins triggered a collective historical awakening. The awakening can take the shape of bombs in Kabul and Baghdad, or political change in government policies, but it is also palpable when poetry voices a critique of the technological warfare and its versions of progress. Contemporary events and the modern ruins are reminiscent of the political impact that the Spanish Civil War and the two World Wars had on poetry. 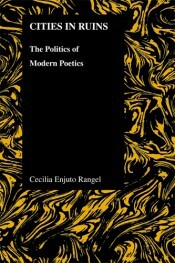 In Cities in Ruins: The Politics of Modern Poetics, Cecilia Enjuto Rangel argues that the portrayal in poetry of the modern city as a disintegrated, ruined space is part of a critique of the visions of progress and the historical process of modernization that developed during the nineteenth century and the first half of the twentieth century. Enjuto Rangel analyzes how Charles Baudelaire, Luis Cernuda, T. S. Eliot, Octavio Paz, and Pablo Neruda poeticized ruins as the cornerstones of cultural and political memory, and used the imagery of ruins to reinterpret their historical and literary traditions. Cecilia Enjuto Rangel, University of Oregon, received her PhD in Comparative Literature from Yale University. Her publications focus on transatlantic poetics and film. She is currently working on an edition of a historical testimony from the Spanish Civil War.